This is not just a story, it’s a love story. Gay Head Light, back when keeper was needed. In 1799 President John Adams commissioned the building of an eight-sided wooden lighthouse which marked the birth of the Gay Head Light. In 1856 the wooden structure was replaced by the brick structure we now know. For 214 years the light guided mariners and fishermen from all over the globe safely past the cliffs of Gay Head and the Devil’s Bridge below. As a young man, I worked the fishing boats out of Newport and New Bedford as well as the weirs and traps off Common Fence Point in Little Compton, R.I. The Gay Head Light was always there to wish us a safe return, a welcome home or a needed point of reference pulling trap when the sea was so high it was the only thing visible above the water. If you put a coin into the telescope at the Gay Head Cliffs, you will look into the three bedrooms where my wife and I raised our four children to the lullaby of the Gay Head Light. It was their Mother Goose and most effective defense against the boogeyman sneaking up on them. On foggy nights, to reassure them that she wasn’t gone but just out of sight for a bit on a little trip, we told a bedtime story. I can remember standing over them while they slept, checking a fever or just touching their hair, swelling inside to the pulse of the light. The light has meant so much to many, including the thousands of Vineyard and Cuttyhunk children who came before. In talking to Vineyarders for this piece, I found a universal love of the light going back to the earliest memories of Islanders and visitors alike. Beverly Wright, today chairman of the Aquinnah selectmen, remembers how as children they met at the light in the morning and then again in the evening to play jump the beam, a version of the game red light, green light. She too remembered that the light kept the boogeyman away. That rascal was everywhere. 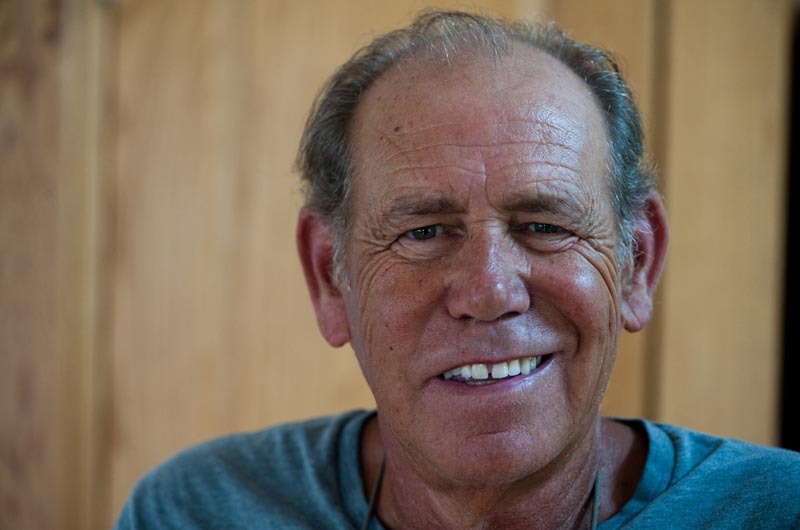 Len Butler, who is heading up a project to save the light by moving it, vividly remembers his first visit to the light on a misty afternoon 42 years ago that so captivated him and his wife with its magic that they came back, bought a house nearby and raised three children, all swaddled in the magic of the light. Martha Vanderhoop is proud of her grandfather, the first Native American lighthouse keeper, and her father, who was born at the lighthouse. He grew up filled with wonderment as he watched vessels coming and going and later became a master mariner who sailed all over the world, but he always came back to the light. To all these people and the many generations that came before, the thought of losing the light is unthinkable. Lenny Butler oversees geological studies. And yet that’s where we find ourselves at this moment in time. 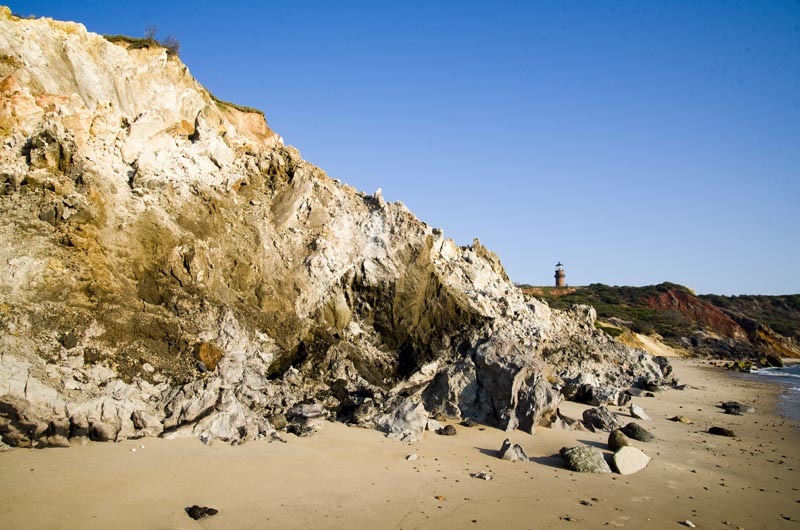 The Gay Head Light, through natural and storm erosion, today stands just 47 feet from the edge of the cliff. It has been put on a list of 11 most endangered historic sites in the country by the National Trust for Historic Preservation. The International Chimney Company, the movers of the Hatteras lighthouse in North Carolina, the Sankaty lighthouse on Nantucket and more recently the Schifter house on Chappaquiddick, say that they can move her but need a minimum of 30 feet all around. That leaves 17 feet to spare. Last year’s severe storm losses are being surveyed in the next couple of weeks and may show a rate that would raise the threat level even higher, with another winter to get through. The goal is to move her in the fall of 2014. Politically and technically, there are many pieces. The building committee is headed by Lenny Butler who is also overseeing geological studies. Meg Bodnar who heads the fundraising effort expresses the so-called washashore sentiment in eloquent terms. “My relationship with it is newer, more basic and more passive, but truly compelling to me. I’m an observer of the lighthouse, someone who lives nearby, basically an onlooker who feels a palpable connection to something bigger because of this sweeping red and white light . . . it connects me to this place,” she said. Richard Skidmore and his wife Joan LeLacheur, who have been the lighthouse keepers since 1990, were constantly aware of the gradual erosion over the years, but about five years ago they became acutely aware of the fact that if something weren’t done, the lighthouse was in real danger of reaching a point of no return. Richard, after much thought and consultation, was the first to come to the realization that the lighthouse would have to be moved. And an effort is now under way to accomplish that. 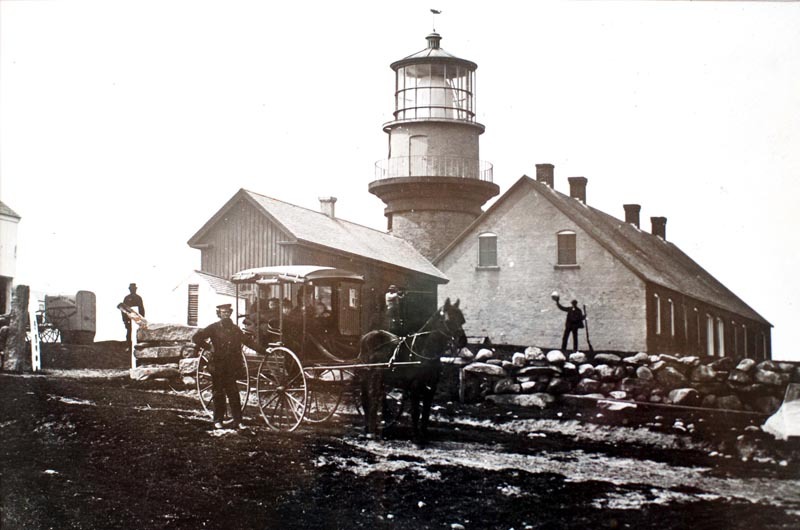 Although it is a town project, the Gay Head Light it is not just a town treasure. The $3 million cost will have to be raised privately, through donations and some contribution from the town and its Community Preservation Act fund. There will be opportunities over the next year to become part of this enormous undertaking which promises no small amount of drama in the doing. The site where the lighthouse will be located is yet to be chosen from a group of three possibilities. All have their unique qualities as well as difficulties. Fundraising is well under way. In a very short time, a considerable amount has been raised from local donors, but the heavy lifting is still to come and the pressure to meet the goal is an enormous weight of responsibility we all carry on our collective shoulders. Clay is actively breaking down and rolling into sea. Upcoming awareness-raising events will include a 10k road race on Oct. 6, and a poetry project in the schools and community that will result in limited-edition, hand-bound volumes. T-shirts, pins and bumper stickers are available at many stores all over the Island including at the lighthouse and at the Cliffs. A website (savethegayheadlight.org) features a stunning aerial view of the lighthouse and surrounding area, lots of history and detailed information about the project. But right now I would ask that you think about the light and what it means to you and your memories, your parents, your grandparents, their grandparents, your children and your grandchildren, and to come to grips with the certainty that she will fall into the sea if we don’t do something about it. I wrote a piece 26 years ago about late-night walks on Cuttyhunk; what follows is an excerpt. 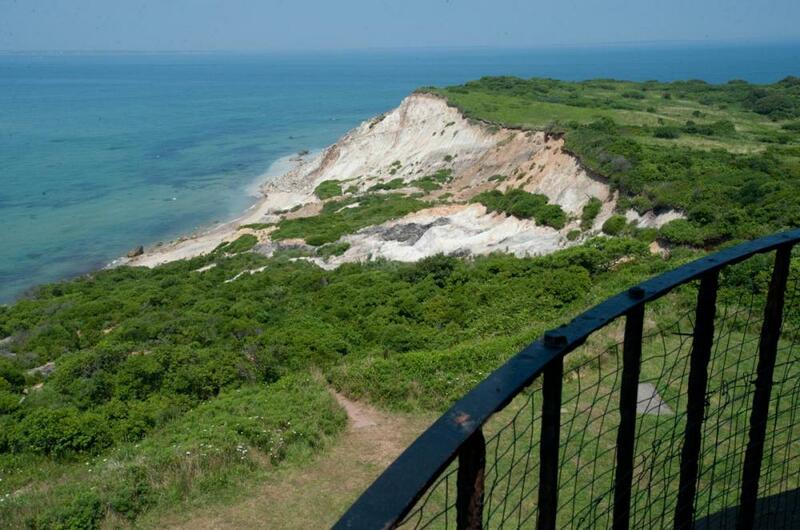 The graveyard sits on a hill overlooking Vineyard Sound and the Cliffs of Gay Head on Martha’s Vineyard nine miles away. On clear nights the brilliance of the Gay Head Light warns and illuminates the graveyard. The three white flashes send a pattern of straight black shadows out from the base of the gravestones to the white picket fence on the west side where they quickly and nervously shoot upward and back into the night. The one red flash brings eeriness and just enough light to dress the cemetery in red without shadows, bringing with it a sense of where I am. I fear the coming of the red light like a child fears the opening of the door to the terrible place in the middle of the night or the fear of some men when they come to the realization that they do not understand anything at all. The Gay Head Light is, has been and will be a muse, a comfort and a friend for a long time to many, many generations of the living, the dead and yet to be born from all walks of life and nationalities. The thought of losing her is unthinkable.